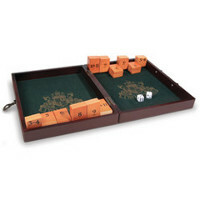 Want to have a different take o the classic “Shut the Box” dice throwing game? You can now enjoy this two-player variation known as the Head To Head Shut The Box Game. After all, a classic that has seen action in pubs since the 12th century is now back in action a good 8 centuries later, where players will race with each other to stand up their rows of wooden blocks simply by rolling dice to correspond with the numbers of each block. Whenever all the blocks are standing, players will score a point by rolling a single coin down the groove of the completed “bridge” into their cup. This is done in honor of the Irish folklore from which the game is loosely derived from. Nice to see that this version will enable players to counter their opponents progress, which is not similar at all to other Shut the Box-type games, throwing a monkey wrench into the works since strategy now comes into play instead of just luck. The first person to deposit a quartet into his or her cup will be declared the winner. The Head To Head Shut The Box Game can be yours for $39.95 from Hammacher.